What matters is that mobile trading has really come to stay in a big way in the retail trading space. Let us first look at what trading via smartphones is all about? Trading via smartphones has picked up in a big way over the last five years. With the advent of mobile-friendly applications, people now prefer to trade on-the-go as opposed to sitting in one spot and tracking the markets all day. Check the break-up below of the modes of trading on the NSE cash segment on a daily basis. 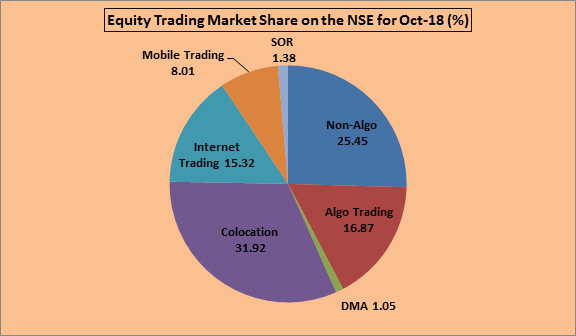 Most of the co-location trading and algo trading in the above chart is dominated by institutions and proprietary books of brokers. Despite this mix, mobile trading accounts for over 8% of the total turnover in the cash market. Consequently, if you consider mobile trading as a percentage of retail trading volumes, then it would actually be much higher. What matters is that mobile trading has really come to stay in a big way in the retail trading space. Let us first look at what trading via smartphones is all about? What does trading via smartphones entail? Trading via smartphones can be done in two ways. Firstly, you can access the internet on your smartphone and then initiate trades after going through the standard authentication process. This is internet trading through a smartphone. The second way of trading via smartphones happens when you download an app (short for application) for the same. How do you download the app? Two of the most popular mobile operating systems (O/S) today are made by Apple (iOS) and Google (Android). Most phones these days are generally embedded with either of the two operating systems. There are other operating systems like the Microsoft O/S but they are not as widespread or robust as Android and iOS. Based on the O/S in your phone, you can download the respective trading app. For example, if you have the Android, then you can download the trading app from the Android Play Store, where it is available for free download. This procedure is the same even for iOS. For example, the IIFL Markets mobile app can be downloaded directly either from the Android Play Store or the Apple Play Store. Once the app is downloaded, you need to run the app and you are ready to trade after authentication. Just create a shortcut on your mobile home screen and you are ready to trade! Are there some key advantages of app-based smartphone trading? The smartphone app gives you the power of trading at your fingertips. You can research the stocks of your preference and accordingly execute trades with just a few clicks. This way, you get research and execution in one place. Trade round the clock, around the world. You are not confined by region or time zones. Apps accept orders even late in the night; although the actual execution will only happen during trading hours. But surely it simplifies your job by a great deal. Most apps guarantee a seamless experience. Your bank account, broking account, and your demat account are all connected and can be accessed via your mobile itself. In-built security features are added to ensure that you do not lose data or you can prevent any hacking attacks. Some precautions are called for from your side. Mobile trading with apps is a great value-addition as it makes your life simpler, more “mobile”, and gives you access to your trading account at any time. However, consider these precautions before you get full-time into smartphone-based trading. Ensure that your smartphone has sufficient RAM, memory capacity, and free space to run the trading apps smoothly. The last thing you want is your app hanging midway through a crucial trade. Use a stable data connection; ideally a dedicated line. Avoid using your mobile app on shared Wi-Fi networks. Trading on public networks like airports and hotspots should best be avoided. Take care of your hardware, which is the smartphone itself. Avoid downloading unnecessary pictures and videos and have a good anti-virus installed. Make it a point to schedule a mobile clean-up cycle at midnight. Your trading app will regularly send you messages on new versions and additions to download and upgrade your app. Do not miss out on these as you may lose out on some key features. Don’t overtrade just because the smartphone app is easily accessible. Risk management remains the same. Smartphone trading is what India is moving towards. Use it, but also apply some basic checks and balances. You will be overwhelmed by its benefits and seamless interface!